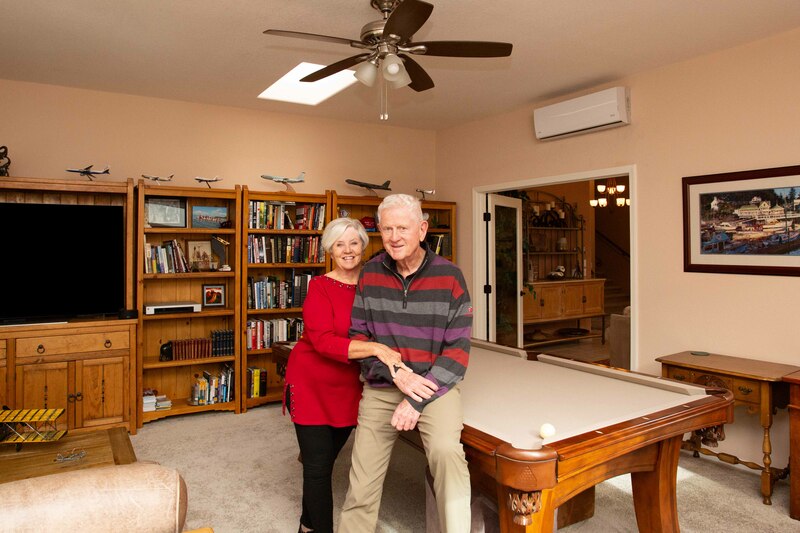 Roy and Jacquie Christiansen began their SaddleBrooke adventure in a villa and progressively moved up in square footage. 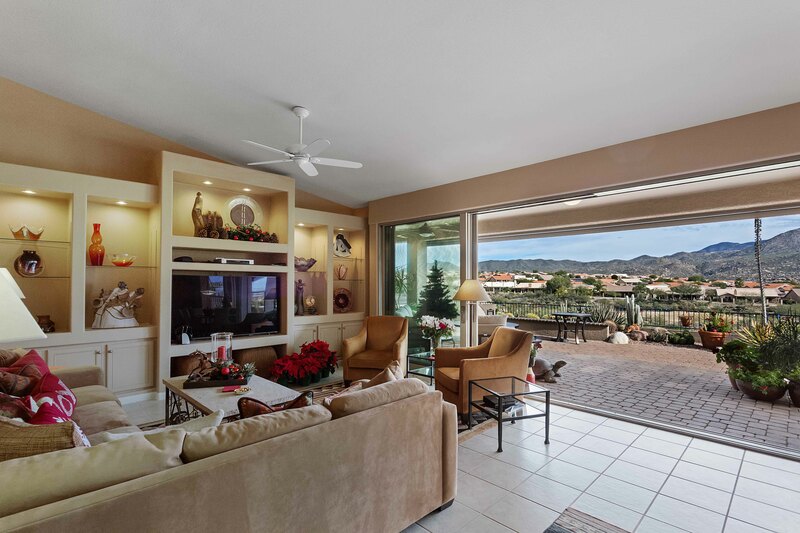 Their third and largest home is a two-story 4 bedroom plus den 3410 sq ft Galleria on a premium east-facing view lot overlooking the golf course and mountains. 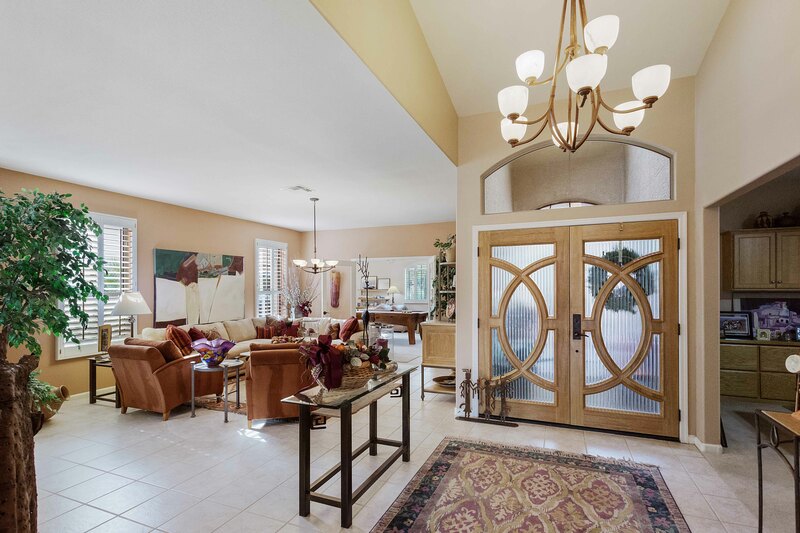 “We didn’t realize what an active, busy social life we’d have in SaddleBrooke and found we needed more space for entertaining,” explained Jacquie. With James Widdows, owner of Northwest Builders, as general contractor, the Christiansens have completed several stages of remodeling over the past fourteen years to modify the master bath, den, kitchen, bar area, downstairs second bedroom, the family room and even the addition of a 400 sq ft den. “They were really easy to work with,” said Widdows, “Jacquie always clearly knows what she wants.” An art school graduate, Jacquie originally had her mind set on a career in interior design before becoming a Pan Am flight attendant and meeting her husband. Added to the front of the home, the new 20’ x 20’ den is accessed by double French doors that replaced the original living room windows. The addition flanks the opposing garage affording space for a soaring gated atrium and privacy for a new glass paned front door. With an executive desk and a wall of shelves housing an extensive book collection and numerous airplane models, the room is not only a handsome library for the former aerospace sales rep, but also Roy’s “Man-Cave” where guests may relax over a game of billiards. The room’s south wall bumps out a few feet beyond the home’s existing footprint affording Roy mountain views from his desk through a French door opening to the backyard. The addition’s French doors, skylights and clerestory windows add the natural light that Roy missed in his former den. At the back of the home adjacent to the kitchen, the family room experienced a dramatic renovation with the removal of the existing standard slider and two existing windows to make way for a wall of glass formed by a custom 17 foot stackable sliding glass doorway. Three panels fold one into the other opening a seamless indoor/outdoor entertainment space. To enhance the views, Northwest Builders removed an obtrusive patio pillar which required reengineering and reinforcing the span with a heavier glulam beam. 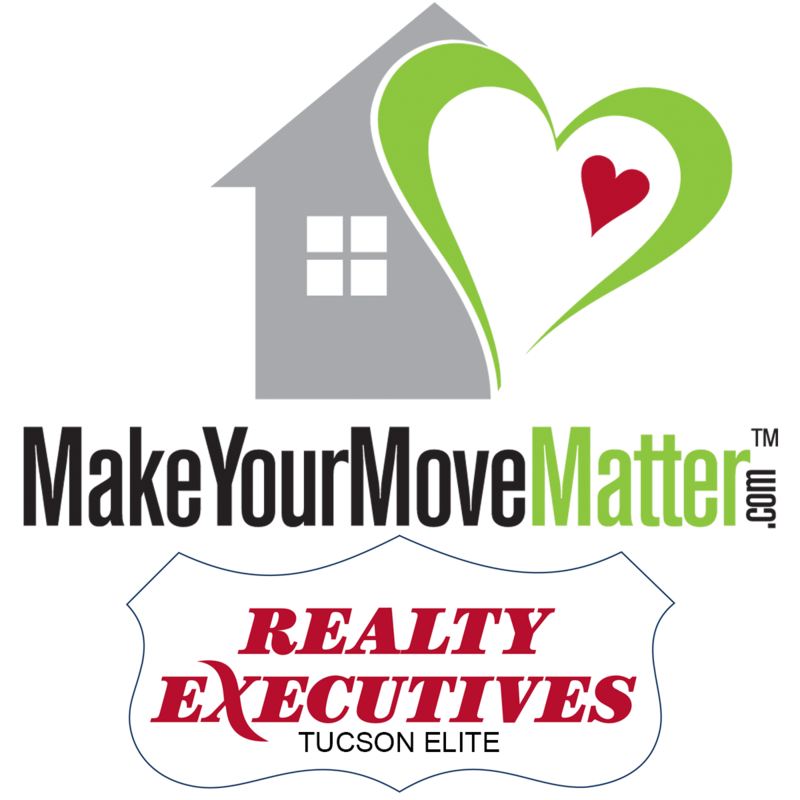 The Christiansens have maximized their stunning ridgetop view of a sweep of golf course greenery and the mountains beyond. While the Christiansens had the 20’ x 20’ addition plumbed to accommodate a bath should a future owner wish to convert the space to a casita, they largely put resale out of mind as they remodeled their home to suit their preferences and personal taste.